Little blue herons, also known as blue cranes, little blue cranes, and levee walkers, are small members of the stork family that inhabit the Americas. Size – They are usually about 24 inches (60 cm) long. Weight – They weigh around 11.5 oz. (325 g). Wingspan – Fully stretched wings can measure up to 40 inches (102 cm). Plumage – Breeding Adults have blue and grey plumage, the head and neck are purplish with long filament-like plumes, the legs and feet are dark blue. 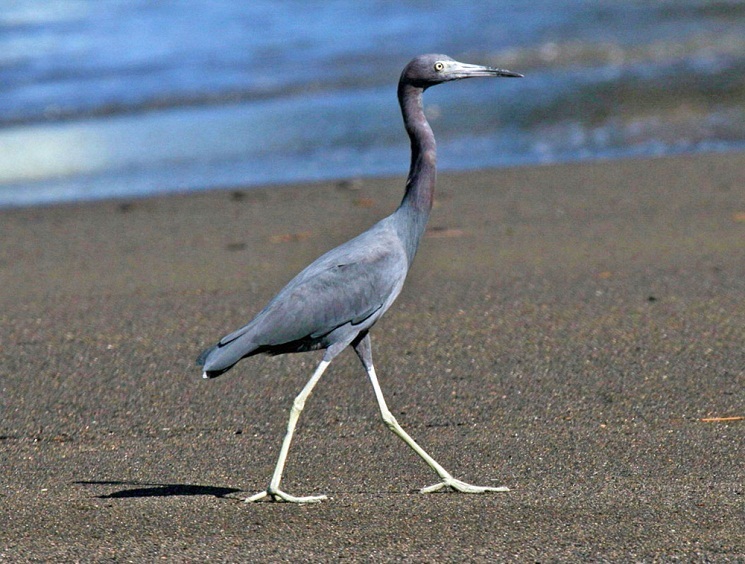 Non-breeding Adults exhibit a dark-blue neck and head plumage and pale legs. 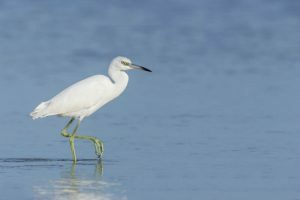 Juveniles are completely white other than dark wing tips and dull greenish legs, they acquire the adult plumage as they grow older. They are distributed over a large stretch from Massachusetts to Florida along the Atlantic Coast, Gulf of Mexico. 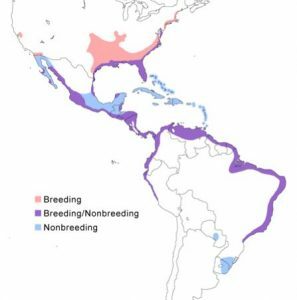 parts of Central and South America as well as the Caribbean islands. Little blue herons live near fresh or salt water bodies, their dwelling places include wetlands like streams, lagoons, ponds, marshes, flooded grasslands, canals, ditches and fish hatcheries. 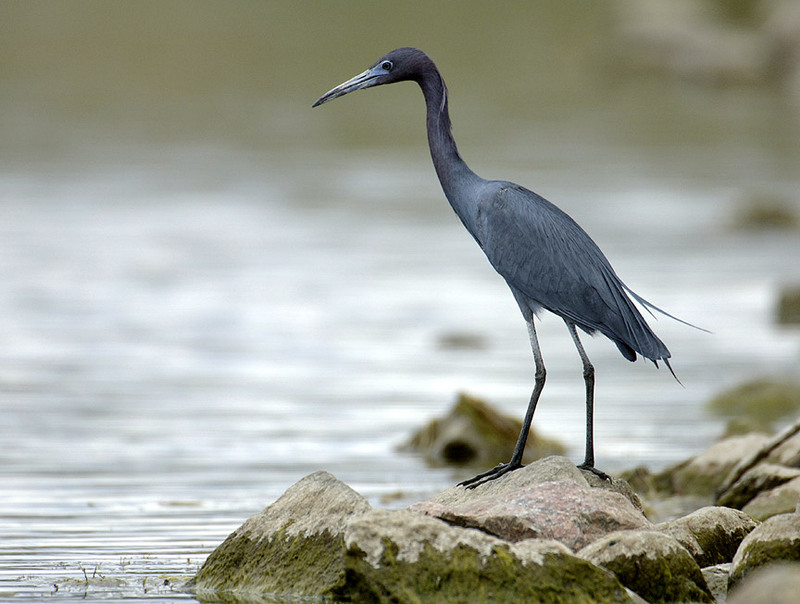 Little blue herons are opportunistic and patient predators, standing and waiting for their prey until they can make the final blow. 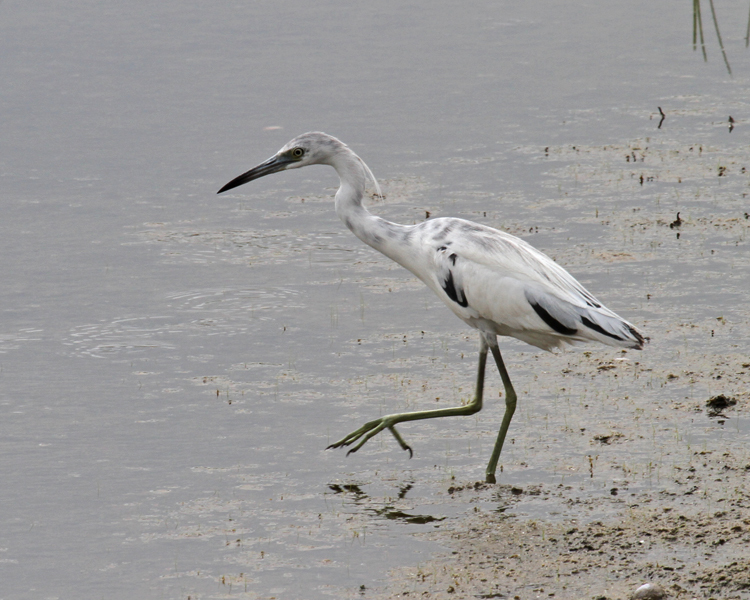 Since they are not too energetic, they mostly walk at a slow pace along the marshes. Though they hunt alone, they dwell in small or big communities. They fight noisily with their screams resembling that of parrots. 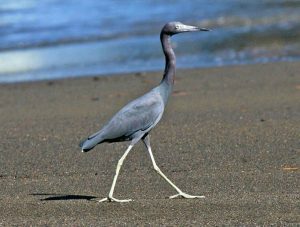 With their necks stretched upwards, the males try wooing the females by bending in front of them also expressing themselves by vocalizing alongside other movements like neck swaying. If impressed the female approaches the male with initially aggressive interactions gradually transformed to affectionate gestures like nibbling at each other’s feathers and crossing their necks. The male then proceeds to gather sticks for the female who duly receives and places them into a nest structure. The female lays 4-5 eggs on average, over a period of 5-8 days. Incubation is done by both parents for 22-24 days. Other than raising their head, the chicks cannot move much and depend on their parents for food which is either provided in their nest or later put into their mouths. After about 21 days they can make short trips to nearby branches while in 30 days they start taking periodical flights. 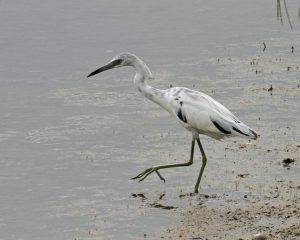 At 42-49 days they become fully fledged capable of moving around on their own. One year after their birth they can begin to breed. They can live for 7 years in their natural habitat. 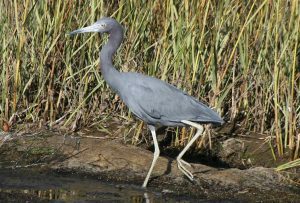 They are carnivorous, thriving on fish, frogs, snakes, turtles, lizards, shrimp, fiddler crabs, crayfish, aquatic spiders, and insects. 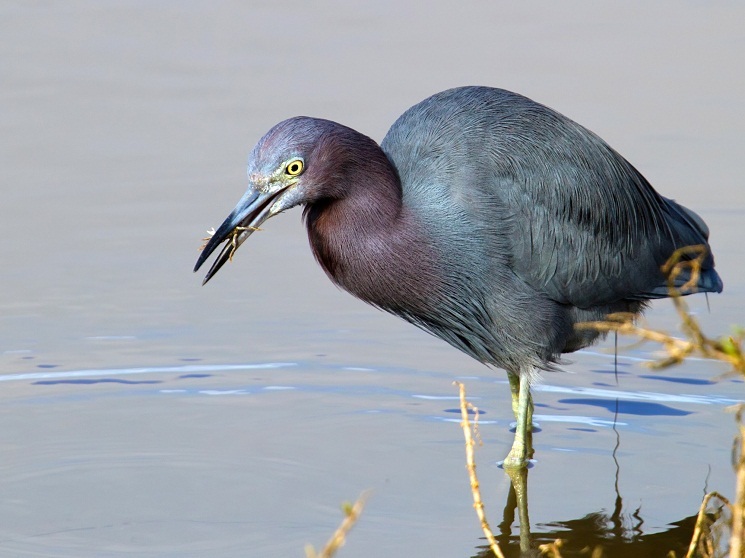 When the water in the swamps and marshes dry up, they even eat beetles, grasshoppers, and crickets. These birds have a white plumage in their initial years, like snowy egrets, which thereby help the young herons to shield themselves from predators and catch fish conveniently whenever they are in the company of these birds. These birds are preyed upon by cougars, raptors, and coyotes, while their eggs are mostly devoured by ravens, foxes, raccoons and crows. 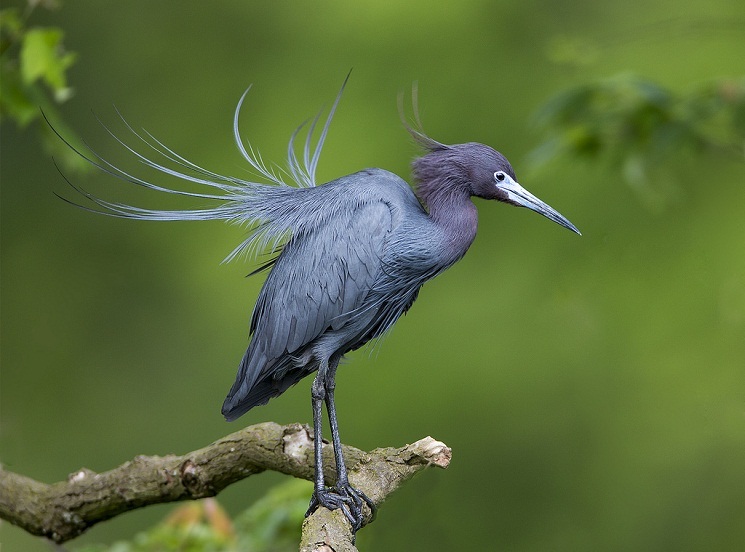 The IUCN has listed the little blue heron under the ‘Least Concern’ category. 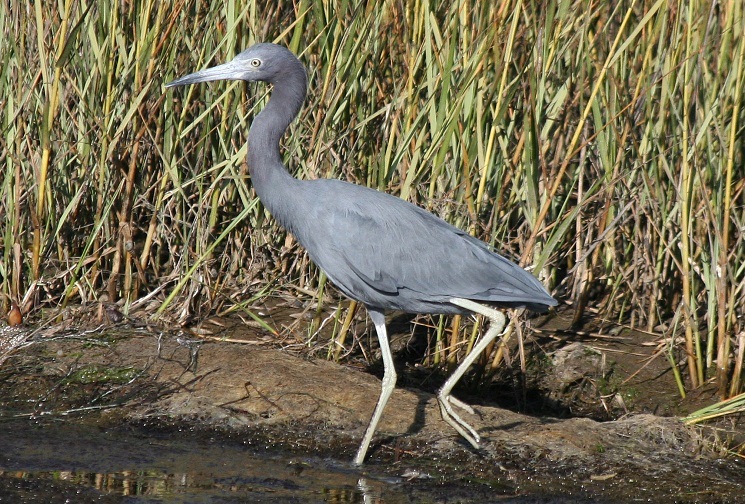 The oldest recorded little blue heron was 13 years 11 months old which died in Maryland in 1971. 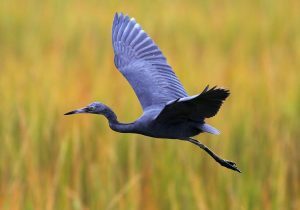 Their dull plumage spared their numbers from declining in the late nineteenth and early twentieth centuries when the population of heron species and egrets lessened due to the demand for colorful feathered hats.